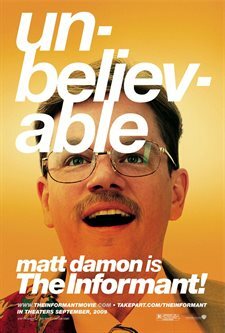 Based on the book "The Informant: A True Story" by Kurt Eichenwald. It was one of the FBI's biggest secrets: a senior executive with America's most politically powerful corporation, Archer Daniels Midland, had become a confidential government witness, secretly recording a vast criminal conspiracy spanning five continents. Mark Whitacre, the promising golden boy of ADM, had put his career and family at risk to wear a wire and deceive his friends and colleagues. Using Whitacre and a small team of agents to tap into the secrets at ADM, the FBI discovered the company's scheme to steal millions of dollars from its own customers. But as the FBI and federal prosecutors closed in on ADM, using stakeouts, wiretaps, and secret recordings of illegal meetings around the world, they suddenly found that everything was not all that it appeared. At the same time Whitacre was cooperating with the Feds while playing the role of loyal company man, he had his own agenda he kept hidden from everyone around him-his wife, his lawyer, even the FBI agents who had come to trust him with the case they had put their careers on the line for. Whitacre became sucked into his own world of James Bond antics, imperiling the criminal case and creating a web of deceit that left the FBI and prosecutors uncertain where the lies stopped and the truth began. Download The Informant in Digital HD from the iTunes store. The Informant images are © Warner Bros.. All Rights Reserved.